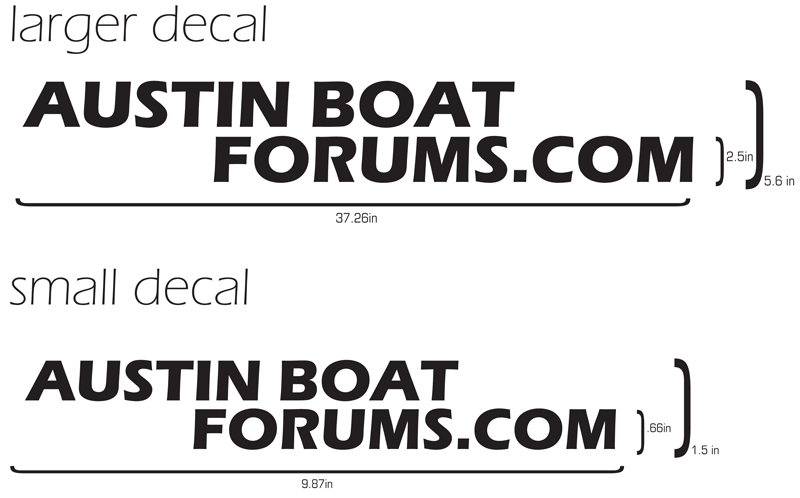 I have ordered vinyl decals that say AustinBoatForums.com and I am making them available free to anyone who wants to put it on their boat or their vehicle. They will be available in black and white. That you have 10 posts. That you post a picture of your boat or vehicle with the decal on it! If there's interest out there in the larger version that I'll be putting on my tow trailer and boat, I can sell those for $6.00 shipped to your door. It's quite big, I was surprised how inexpensive they are. I'll be posting pics of my boat and trailer as soon as I get out to put them on!